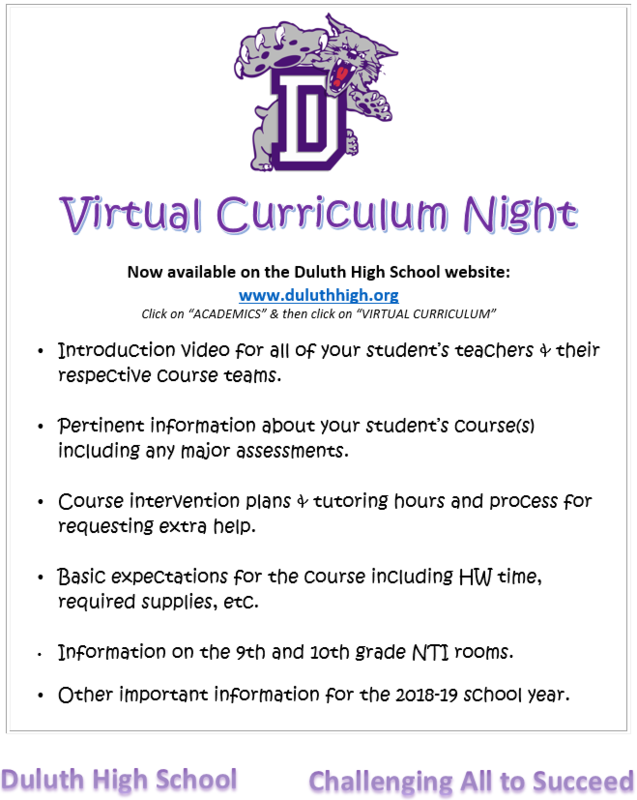 Virtual Curriculum Night for Duluth High School is now available on the Duluth High School website; you may access the DHS website by visiting www.duluthhigh.org. Please visit our site and click on the "Academics" tab and then click on the "Virtual Curriculum" link (or click here https://www.duluthhigh.org/apps/pages/index.jsp?uREC_ID=672289&type=d&pREC_ID=1117903). There you will find introduction videos for all of your student's teachers and their respective course teams, pertinent information about your student’s course(s) (including any major assessments), course intervention plans and tutoring hours and processes for requesting extra help, basic expectations for the course (including HW time, required supplies, etc. ), information on the 9th and 10th grade NTI rooms, and any other important information that you need to know for the 2018-19 school year.